Your decision to install new cabinets in your home or office will be a great investment, increase value and add functionality and comfort in your indoor spaces. We offer stock and custom cabinets. All our cabinets will be installed based on your needs, design and budget. If you are a “do it yourself” kind of person, we can help you too. You can purchase and install any of our cabinets direct from us, and install them yourself. We provide or install all types of cabinets including kitchen cabinets, bathroom cabinets, bar cabinets, home office cabinets, library cabinets, laundry room cabinets, outdoor cabinets and more. No matter what your cabinet needs are, Preventive Maintenance Support Services will provide and install top-quality cabinets for your home or office spaces. Are you looking to upgrade your kitchen or bathroom? Browse our three cabinet categories and find the cabinets you like. You can purchase direct from us and install them yourself or, we can install them for you. These cabinets are made of solid wood and we guarantee they will not crack, split or warp. Whether you install them yourself or we do it for you, our in stock cabinets are made from the best materials and best workmanship available today. We make our cabinets from scratch. Our state of the art cabinet shop allows us to offer a higher quality product for a fraction of the price of our competitors. Don’t buy off the shelf cabinets from other installers when we can build a superior product custom matched to your new space. 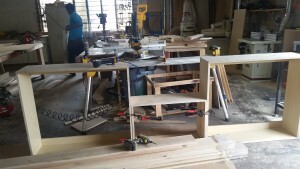 Our cabinets are handcrafted using kiln dried and exact planed lumber (wood planing). 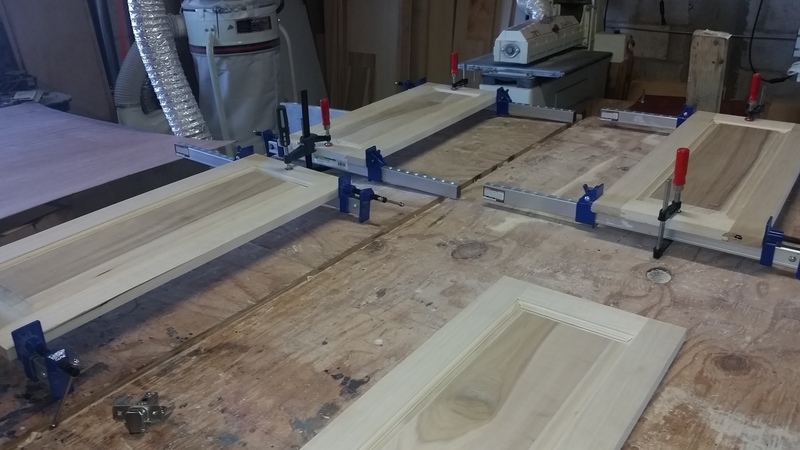 Poplar and pine raised panel doors are our most popular, but oak, maple, cherry, chestnut or any other species are available. The doors for our kitchen cabinets and bathroom vanities are also made onsite. We don’t farm out the doors to a factory, we make them in house, they are stunning. We can stain or dye the doors and cabinets to any color of your choosing. once the color is applied we offer many finishes including polyurethane and lacquer. Finishes can be mat, satin, semi-gloss & gloss. We are licenced contractors CBC 1257846. This is really important! We are not just a cabinet shop. This means we we are authorized by your permitting authority to do this work. It also means our employees are covered by workman’s compensation insurance and, we carry general liability insurance. And thirdly, we can move walls, install windows, add a skylight, move appliances and any other kitchen configuration modification that you can think of. Protect yourself, hire a licensed general contractor! new kitchen cabinets. Crown adds a regal look to any new kitchen. We use wood stain for the majority of our new kitchen cabinets and doors. Wood stain is a solvent based emulsion that transfers pigment to the wood. We use conditioners prior to applying stain to help even the color and allow the stain to soak in to the bare wood. However, for the most part, wood stains leaves the pigment on top of the wood. We can utilize additional application to darken the color selected. We can also wipe a stained wood surface with thinner and lighten the color. The affect of adding more and more layers of stain reduces the natural wood features. That is to say, achieving darker and darker wood stain color reduces the what can be seen of the woods grain and marbling. Some customers really like the natural features of wood and don’t want to hide them with color. For these customers we use wood dyes. Wood dyes are water based emulsions. We can purchase powders and mix them in water or buy premixed primary colors. We then have to mix the primary colors together in order to try and match the desired final color. Water based wood dyes are applied with a brush or a sponge to the wood surface where the water and dye are absorbed by the wood. The wood features are thereby enhanced by the wood dye and not masked. The process of dying wood is more complex than staining, and therefore more expensive, but the end result can be astonishing. Most kitchens and bathrooms have similar dimensions. Standard size cabinets can, for the most part, be used to adequately utilize the rooms space. There are times when standard cabinets don’t fit and “blinds” are installed in order to fill the gaps between cabinets that don’t fit perfectly. In some cases, it’s convenient to have a cupboard as part of a cabinet set. Cabinet cupboards can fill large open spaces and really highlight your rooms theme. Pantry cabinets are not found in standard cabinets set, but can be a great improvement. Corner spaces in kitchens and bathrooms can also be a problem for standard size cabinets. In many cases the entire corner area is lost with ordinary cabinets. Lazy Susan’s can be a big help in occupying a corner, but finding one that fits just right can be very hard. Standard upper cabinets are 36”: tall, but your wall height is 96” or more. You might not be able to easily reach the top shelf in a taller upper cabinet, but their presence can really complement a rooms ambiance. Adding crown molding on taller boxes is also a real game changer in creating whatever environment you are looking for. Factory made cabinets tend to look like they are made in a factory. The natural wood characteristics get lost in the process. Natural wood features like marbling and the grain, are quite stunning when given the “personal touch” in the making. If you’re a real wood enthusiast, you might want to consider wood dying over a conventional stain. Wood stains build up on top of the wood. Adding additional stain coats darkens the color, but hides some of the wood characteristics. Wood dyes don’t build up on the woods surface, instead they are absorbed into the wood. Wood dies don’t cover-up as much of the wood characteristics than stains and the resulting appearance is noticeable. Perhaps your looking for solid color cabinets but can’t find a color you want to match or use as a contrast? Custom made cabinets can be painted virtually any color you’re looking for.